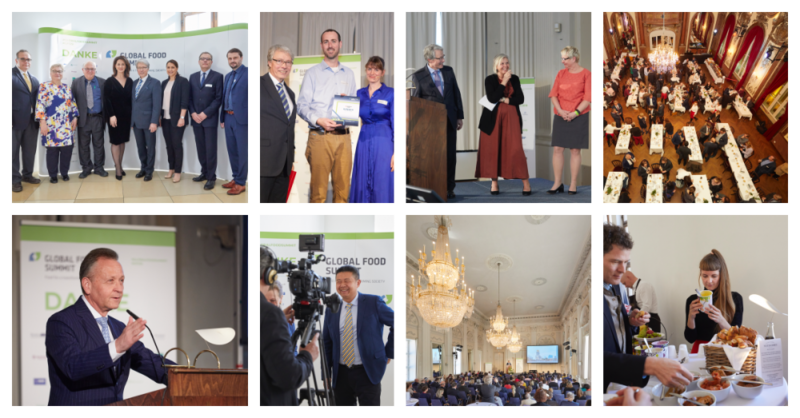 The fifth Global Food Summit took place on 20 and 21 March 2019 in the Max-Joseph-Saal of the Münchner Residenz. This was the first time that the Science Conference had taken place in Munich; it had previously been held in Berlin. The change of location was based on an invitation from the Bavarian State Government, represented by the Bavarian Nutrition Cluster. The topic of this year's conference was: "Foodtropolis - Are cities changing our perception of food and nature? A total of 27 speakers and panelists presented their projects and ideas in front of approximately 220 conference topics. Michaela Kaniber, Bavarian Minister of State for Food, Agriculture and Forestry, gave the opening speech on the first day of the conference and presented how important the topic of food production is for Bavaria. In order to promote more innovation, Bavaria wants to become the "founding country number one in Europe" and "turn ideas into added value", explained Mrs. Kaniber. The keynote speech of the conference was given by Her Excellency Mariam Al Mehairi. She gave insights into the Food Security Strategy of the United Arab Emirates (UAE). The goal is to be in the top ten of the Global Food Security Index by 2021 and to lead the index by 2051. For H.E. Mariam Al Mehairi, food security means giving all citizens access to a nutritious, healthy and active life. The third speaker of the day was Maximo Torero, Assistant Director of Economic and Social Development at the Food and Agriculture Organization (FAO) of the United Nations in Rome. In his speech, he emphasized the need to close the existing food gap in the world. At the same time, economic development should be supported and the environmental impact reduced - a balancing act - as he himself notes. Afterwards, the start-up session took place, which was opened by Professor Klaus Joseph Lutz, Chairman of the Board of Management of BayWa AG. He pointed out that BayWa AG promotes innovative start-ups in the food sector and enjoys working with them. A large number of start-ups applied for the session, some with disruptive business ideas from the areas of "Vertical Farming", "Circular Systems", "Plant and Animal Data Analytics", "Biotech", "Packaging" and "New Farm to Consumer" marketplaces. Five start-ups from Canada, Israel and Germany were nominated for the Global Food Summit People's Choice Award. Each of the start-ups had three minutes to present its idea or product. Then there was a three-minute round of questions from the audience. At the end, the conference topics voted on who would win. The narrow winner of the audience award before Noyanum is the Israeli startup Redefine Meat (www.jet-eat.com), which wants to produce deceptively real-looking and tasty "meat" using purely vegetable ingredients from 3D printers. This year's partner of the Global Food Summit was the Canadian Embassy, which hosted a joint dinner buffet in the Silver Hall of the Deutsches Theater in Munich at the end of the first day. In his speech, Stéphane Dion, the Canadian Ambassador to Germany, explained: "The Global Food Summit's mission is very much in line with Canada's priorities: "To advance the development of sustainable food through new approaches and technologies, for the benefit of all Canadians, but also for the benefit of the world population as a whole. In addition, we are proud to be associated with other cities, internationally renowned research institutions and companies. Canada is on its way to becoming even more international. The Global Food Summit is a perfect fit for this." Selected Canadian specialities and the first innovative food concepts, such as saltwater shrimps from Bavarian aquaculture and lupine "milk" ice cream, were served at the dinner.